The Ben Ezra Synagogue or El-Geniza Synagogue or the Synagogue of the Levantines, is located in the Coptic section of Old Cairo area. It is considered the oldest Synagogue or Jewish temple found in Egypt represents cultural heritage of outstanding universal values. It suffers multiple environmental, geotechnical and earthquake hazards. The integrated geotechnical and geophysical investigation techniques were done to assess the level of seismic and other geo-environmental hazards and risk that Synagogue suffers from in present and future. This knowledge is required to protect the building against seismic events. The Synagogue suffers high risk in terms of seismic and environmental hazards. The main purposes of the present study are to: (1) Assess the level of seismic and other geo-environmental hazards at Ben Ezra Synagogue. (2) Understand the damage situation for the historic building caused by the recent earthquakes. (3) Offer technical support and advice on restoration and repairs for the damaged structure. (4) Build up knowledge and case studies towards the restoration and repairs, and to survey the damage state of the historic structure. However, Ben Ezra Synagogue is the oldest Jewish temple that was constructed with little or no seismic considerations that represent the largest risk to most communities. These significant historical buildings must be assessed their level of risk determined, and unacceptable risks reduced. 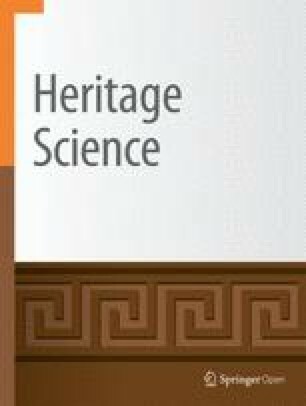 This paper focuses on the issues associated with detailed procedures of risk and hazards assessment for retrofitting of architectural heritage. Many forms of evaluation and related procedures for assessment of seismic risk for historical buildings have been discussed. This study, suggest moderate level of earthquake activity at Ben Ezra Synagogue and this is in a good agreement with the fact that “Egypt is a part of the stable African Shield”, but the existence of old structure such as the Ben Ezra Synagogue may reduce the ability to resist any earthquake shaking. This pilot study is important with respect to the continuous efforts for preservation and restoration of the cultural heritage worldwide. Seismic analysis and planning is part of ongoing archaeological site management and conservation [1, 2, 3]. In the last few years there has been significant and detectable deterioration to some of the major monuments in old Cairo area, like Ben Ezra Synagogue or El-Geniza Synagogue or the Synagogue of the Levantines , calling for an even more intensive and thorough review of their problems and needs, due tone of the most potentially serious, sudden and unpredictable of threats, seismic activity and related earthquakes. Seismic ground response characteristics, defined generally as “site effects”, are inevitably reflected in seismic code provisions. The selection of appropriate elastic response spectra according to soil categories and seismic intensity is the simplest way to account for site effects both for engineering projects and for a general-purpose microzonation study. Contemporary seismic codes (IBC 2000, UBC97, EC8) have largely accepted the significant role of site effects and attempt to incorporate their influence either by means of a constant amplification factor exclusively dependent on the soil class or including additional parameters like the shaking intensity, near field conditions, etc. Even though concerning site classification different approaches exist, the basic idea of the mean value of shear wave velocity over the last few decades of meters (30 m or other) is considered to be a sound parameter for site classification. However soil classification exclusively based in terms of VS, 30 assumption, is a rather simplified hypothesis, misleading in many cases, which can potentially lead to erroneous results, especially in cases of deep soil formations or abrupt stiffness change between the soil layer at − 30 m and the bedrock laying deeper [5, 6, 7, 8, 9, 10, 11]. The structural risk assessment of the architectural heritage includes the steps of acquiring knowledge of built conditions, site and building response characteristics, economic and technical analysis prior to selecting the optimum retrofit strategy [12, 13, 14]. The Ben Ezra Synagogue is situated in the Coptic district of Cairo city. There are two possible explanations for the Jewish sanctuary erected in this specific area. The first is related to a place of bull surges where the child Moses was found safe or this was the place where Moses prayed to God for exempting the Jews from their subjection in Egypt. The land for the synagogue was acquired in 882 AD by Abraham Ben Ezra of Jerusalem. The establishing date of the Ben Ezra Synagogue isn’t known, in spite of the fact that there is great proof from reports found in the geniza that it originates before 882 CE what’s more, is most likely pre-Islamic . In 882, the patriarch of the Coptic Orthodox Church of Alexandria sold a congregation and its grounds to a gathering of Jews, and some nineteenth century researchers had accepted this was the starting point of Ben Ezra. Present day researchers concur that the 882 land deal was to an adversary synagogue . In around 1012, Fatimid caliph Al-Hakim bi-Amr Allah requested the annihilation of all Jewish and Christian spots of love. The first Ben Ezra Synagogue was torn down, “its blocks and timber sold for scrap. The following caliph Ali az-Zahir permitted reproduction of Christian and Jewish establishments, and the synagogue was revamped in the 1025–1040 period . The Architectural Design and outline of the Ben Ezra Synagogue or the Jewish temple has a basilica style, as appeared in, as shown in Figs. (1, 2, 3, 4). There are two stories, a lower floor for male admirers and an upper floor for ladies. Steel bars separate the principle lobby into three sections or passageways. The focal corridor has the work area for Torah perusing. Twelve marble columns bolster the rooftop and 6 marble steps prompt the wooden sacrificial stone. The insides are finished in Turkish style botanical and geometric examples. Ben Ezra Synagogue suffers from moderate to high risk. Therefore, it is very important to assess the engineering and seismic risk for this important archeological structure. For this the hazard was evaluated carefully using all available source of information, including review of the literatures in and around Ben Ezra Synagogue, earthquake catalogues, expected water table level, seismic strength, and finally a GPR survey was held at Ben Ezra Synagogue to detect any suspected archeological remains under the Synagogue. Finally the resonance properties and expected design response spectrum was determined for the Ben Ezra Synagogue. Previously published geological maps and literature on the geology of Cairo area has been integrated within a regional framework and tectonic context of the area under investigation. Having done that, fault intersection has been defined in the area in and around the Ben Ezra Synagogue, as referred in Fig. (5). Determining the soil shear strength in terms of shear wave velocity versus depth. Determinig the amount of expected probabilistic seismic hazard in terms of expected peak ground accelerations for usually the return periods for monuments are 500–1000 years. Determinig the soil and structure natural frequencies of vibrations. Determing design response spectrum for Ben Ezra Synagogue, using the most maximum credible earthquake (MCE). Reviewing available information, previous work and maps (topographic, geologic and seismicity data) related to the Ben Ezra Synagogue area and its surroundings. 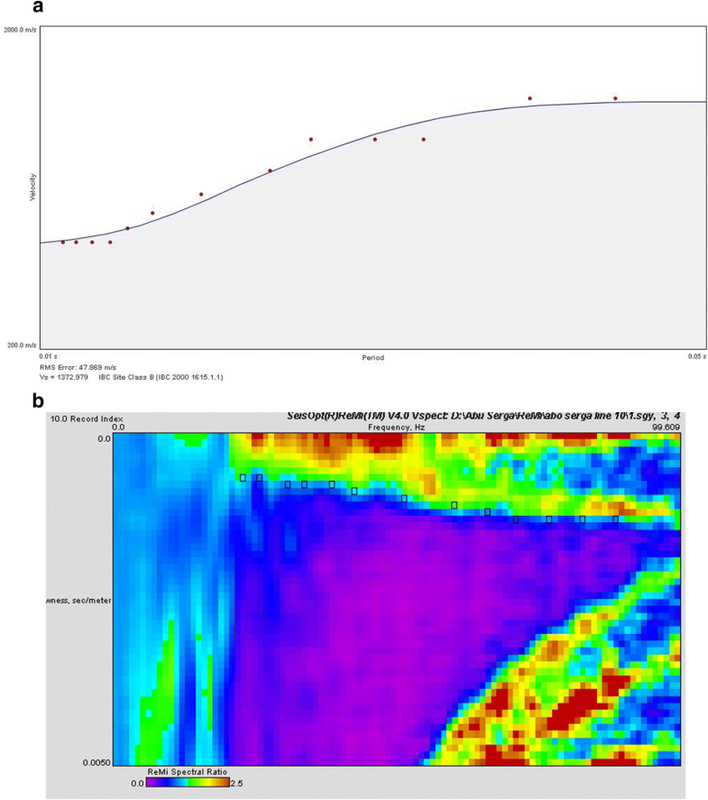 Analyzing and interpreting the collected data of resistivity imaging, refraction microtremors test, soil resonance test, and ground penetrating radar (GPR) data. A field visit was conducted to verify the interpretation and to gather detailed features, principally those that might affect the Ben Ezra Synagogue area. Collecting historical seismicity in and around Ben Ezra Synagogue from the period 2200 BC to 1899 AD. Collecting recent instrumental earthquake catalogue from the period 1899 AD to 2006 AD. Performing regional seismic hazard analysis based on most recent hazard parameters available in Egypt such as, PGA attenuation formulas, seismic source regionalization, and recurrence relationships…, etc. Finally based on the previous collected data the hazard at Ben Ezra Synagogue is assessed and possible archeological features are given. Numerous local cracks and deformation patterns were observed and recorded mainly during the old fluctuations of the Nile before to the construction of the Aswan High Dam in 1968 (ancient dams that caused the loading and unloading of the underground layers under the historic building structures) and during the water removal project (Contract 102 in 2000) to reduce groundwater in the Old Cairo area. Differential consolidation settlement due to the plane loading of the superstructure on the full saturated clay soil and expulsion of the pore water, also the differential settlement due the shear failure of the soil layer under the heavy loading and the poor geotechnical characteristics of the soft bearing clay layer, also the fluctuations of the subsurface water can reduce the bearing capacity of the bearing soil to 50%. The dewatering project in the old Cairo area in 2000 was one of the causes of soil settlement due to consolidation of the thick fully saturated clay layer. The internal deformities of the two facades of the synagogue are clear. Settlement and the rotation and inclination of the structural marble columns and the different cracks in the arches inside the synagogue are well observed; also the vertical cracks in the lintels inside synagogue are obvious. 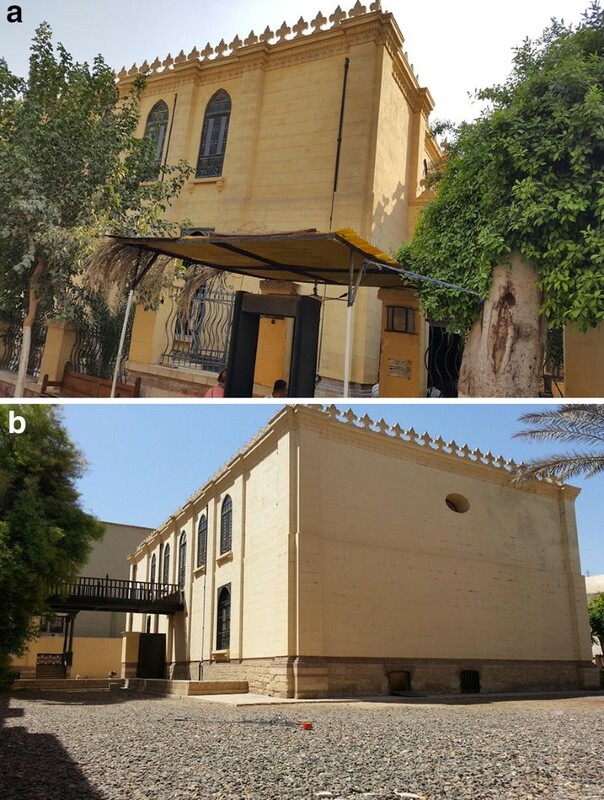 Seismic loading, according to historical facts the powerful earthquakes and the recent earthquakes in particularly the Dahshur earthquake 1992 and Aqaba earthquake 1995, that have stuck old Cairo area, caused medium damages to Ben Ezra Synagogue. The investigated building is behaved in a global way, even if some local mechanisms not producing any wall collapse have been recorded. In addition, its seismic behaviour is conditioned by the interaction of the oratory with the remaining part of the building, which give rise to the so-called building aggregates, whose response towards earthquakes is not very simple to be understood, so that wide studies have been developed on this topic [18, 19]. Degradation of construction and building materials, moisture often plays the important and main role of the degradation of the building materials. The main source of the humidity is the subsurface water and high groundwater level for a long period of time. The technical evaluation of the brick walls provided a general case of in and out of plane deformations. Neither did the stone walls any great damage, although some irregularities were found in the stone walls of the synagogue structure. The protrusion was not great, which suggested that the seismic motion was not so large and that the land subsidence affected the structure. Cracks and disarrangement were seen in the stone walls and stairs. But ground subsidence made the entire differential settlement of the synagogue structure, and it is presumed that the concentrated strain caused them. Also, peeling was seen on some corners and coping stones, but it can be determined that this did not reduce the strength of the body. There was little damage on the stone surfaces. Where this damage was from the earthquakes was not evident, but surrounding land seemed to have subsided due to earthquakes and it was presumed that the damage came from the earthquakes. The present study uses the Refraction Microtremors (ReMi) method to determine and calculate the S-wave seismic velocity with depth for Ben Ezra Synagogue. This is important to determine the depth to the bedrock [any solid rock underlying the soil with S-wave > 765 m/s, the national databases of the US Geological Survey (USGS)]. Louie  explained that, the refraction microtremor technique is based on two fundamental ideas: (1) common seismic-refraction recording equipment, set out in a way almost identical to shallow P-wave refraction surveys, can effectively record surface waves at frequencies as low as 2 Hz; and (2) a simple, two-dimensional slowness–frequency (p–f) transform of a microtremor record can separate Rayleigh waves from other seismic arrivals and allow recognition of true phase velocity against apparent velocities [20, 21, 22, 23, 24]. ES-3000 seismograph was used for the measurement of background ‘noise’ at Ben Ezra Synagogue and its surrounding area. Three profiles were conducted around Ben Ezra Synagogue, as shown in Fig. (6). ReMi analysis presented herein was developed using 12 channels (14 Hz, geophones) set along a straight-line array with different receiver spacing. Receiver spacing for ReMi profiles used. Unfiltered, 30 files of 20 s each were record for surrounding “noise” [25, 26, 27, 28]. The method was applied using the well Known Optim Software for ReMi data modeling. Figures 7 and 8 show the dispersion curve and spectrum P-F image (Remi Spectral ratio of surface waves) for ReMi profiles ReMi-1 to ReMi-3 respectively. The excluded models for S-wave velocity with depth for ReMi profiles ReMi-1 to Remi-3 are shown in Figs. 9, 10, 11. Table 1. Summarizes the receiver spacing for ReMi profiles used. It is noticed that outside Ben Ezra Synagogue, the S-wave velocity detected is about 900 m/s for average depth of about 6.5 m, and reach to 1600 m/s from 15 to 28 m depth. Refraction microtremors test was applied to four tests around the Ben Ezra Synagogue to detect the shear strength in terms of S-wave velocity and detect the average depth of the bedrock. The test was done using normal p-wave geophones and normal refraction equipment . The test was done using 30 records of 20, seconds each cultural noises coming from culture disturbances inside sand bags and leveled 14 Hertz p-wave geophones. Using multichannel analysis of surface waves (MASW)  and Refraction Microtremors described by Louie , techniques, a total of four tests inside the Synagogue and another four tests outside the Synagogue were used to detect the average s-wave velocity within the Ben Ezra Synagogue. The bedrock velocity is thus 6–7 m at Ben Ezra Synagogue site (USGS, 1980 take S-wave velocity of > 765 m/s to be the velocity of the bedrock). It is well-documented phenomenon that earthquake ground motion can be amplified by local site conditions, e.g. [29, 30, 31, 32, 33] When earthquakes emerge from the base of more competent rocks into the less competent fragmented rocks (the soil or the uppermost nearly 100 m), it could change dramatically. This near surface impedance contrast affects the frequency-amplitude content of earthquake ground motion. It can also change one of the most important parameters controlling the damage of earthquake ground motion, which is its duration. The nature of the soil is forcing the earthquake to be changed depending on its own resonance properties [34, 35]. Ben Ezra Synagogue local soil conditions and structure response is very important for ground motion change. Generally the soil found at Ben Ezra Synagogue or in Old Cairo is famous of the existence fill, and rocks which is famous of little or no ground motion amplification. The aim of the study is to determine the natural frequency of vibration of the soil present at Ben Ezra Synagogue and the Natural frequency of vibration of the Synagogue structure itself. Also to determine the amplification factor for the Synagogue to be able to deal with the PGA emerging from the bedrock. A high dynamic range Seismograph (Geometrics ES-3000-Fig. 12) mobile stations with triaxial force balance accelerometer (3 channels), orthogonally oriented was used. The mobile station was used to record the horizontal components in longitudinal and transverse directions in addition to the vertical components. The sensors having natural frequencies of (4 HZ) . Kanai  first presented the utilization of microtremors, or encompassing seismic commotion, to gauge the quake site reaction (soil enhancement). After that heaps of individuals took after this work yet from the purpose of soil enhancement of seismic tremor vitality for various frequencies, e.g. [37, 38, 39, 40, 41, 42]. The soil response derived using microtremors is very complex. In almost all cases, the very calm sites during the night or early time hours of the morning are successful in driving the site response. This is because traffic affects the site response and sometimes hides the original soil response. Moreover, the higher the traffic noise, the higher the amplitude of the amplification at these sites. 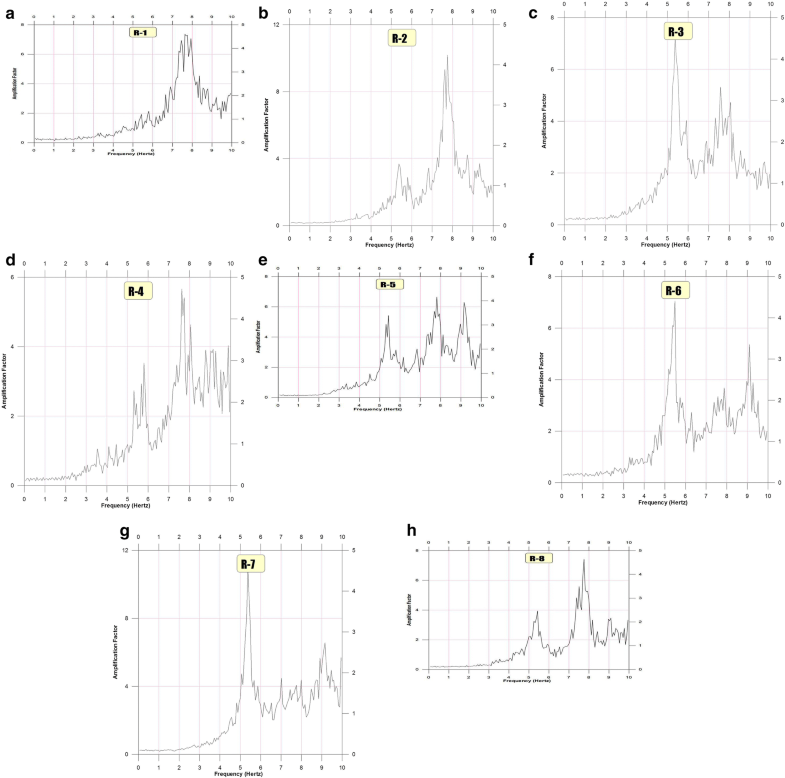 Moderate soil excitation leads to identify all soil resonance peaks (fundamental and all other harmonics) however, it inserts sometimes resonance peaks not related to the soil but mostly to the source of the noise itself “e.g. traffic”. Recording 10-min of microtremors data using a mobile station moving among variable free-field or the structure of Ben Ezra Synagogue itself. Zero correction to the total 10-min microtremors noise at time domain was applied. Each of these series was tapered with a 3-s hanning taper and converted to the, frequency domain using a Fast Fourier transform. The amplitude spectrum has been smoothed by convolution with 0.2-Hz boxcar window. Site response of a given site location is derived by dividing the average spectrum of the mobile station for all processed 10-subwindows at each site; over the constant spectrum which constitutes the base of this average spectrum (we usually compared this value by the value calculated from a reference station recorded over the bedrock of the area—or Reference site). The final response curves have been smoothed by running average filter for better viewing. A complete description to the methodology can be found in . Natural frequency of vibration of both the soil and Structure of Ben Ezra Synagogue was determined. 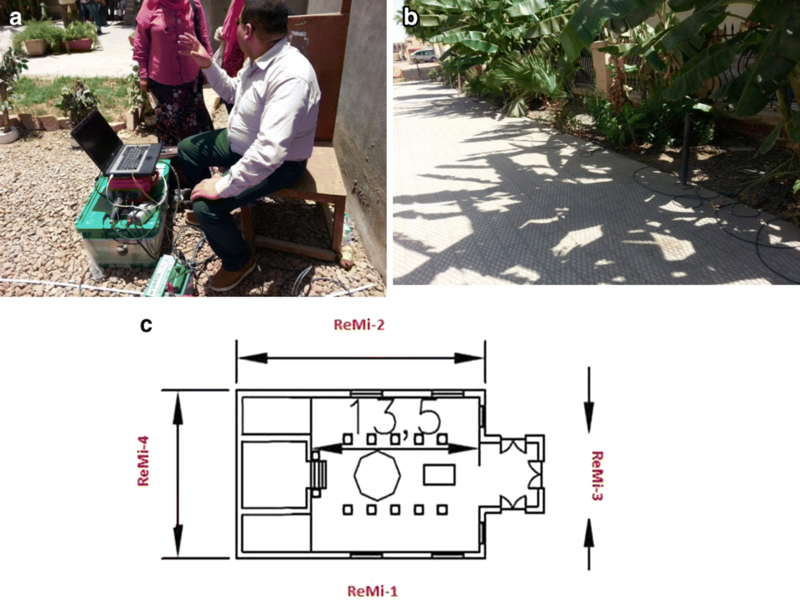 Nine soil resonance stations were used to drive site response at Ben Ezra Synagogue (as shown in Fig. 13). Soil resonance stations used to drive the soil response, are distributed over the nearest exposed soils beside the Synagogue. The soil show nearly bedrock nature with little or no natural frequency of vibration. Although the fundamental natural frequency of vibration inserts biggest energy inside the structure, the other two peaks will contribute to add more energy from earthquake vibrations. 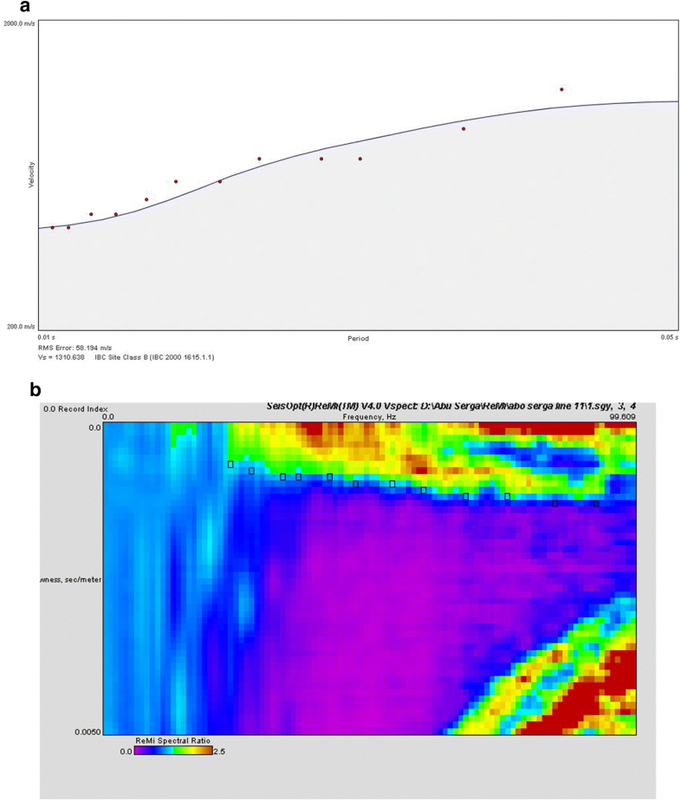 The soil response found at Ben Ezra Synagogue is almost flatty shape with no specific natural frequency of vibration or significant amplification, as shown in Fig. (13). This effect is most probably due to the nearness of the bedrock found at this area. Natural frequency of vibration for the basement floor is determined using the stations also. It can be seen that there is no or little resonance peaks and little or no amplification exist for the Synagogue basement floor. The roof is showing natural frequencies of vibration (7, 8 and 9 Hz) with amplification factor between 6 and 10 times, as shown in Fig. (14). While the basement is showing nearly the bedrock effect with little or no amplification factor. Table 2 summarize the natural frequency of vibration for Ben Ezra Synagogue soil, basement and structure. The microtremors method used to show natural frequency of vibrations succeeded to show the resonance frequencies of vibration, however the amplification factor is affected by the level of the background noise. It is thus important to realize this in the design response spectrum. The response spectra for 1992 Dahshuor earthquake which estimated with a local magnitude 5.3 M (duration magnitude) on the Richter scale occurred at Dahshur area 31 km southwest Cairo, was selected as the best earthquake for most effective zone near Ben Ezra Synagogue to construct the design response spectrum for the Synagogue. The original acceleration time history was recorded 10 km away from the Synagogue over the bedrock of Cairo city at Mokattam area (about 10 km from Ben Ezra Synagogue). This is considered to be the first response spectrum done for all earthquakes that ever affected Egypt. Fortunately, this earthquake is considered one of the most important earthquakes that affected Egypt in the last 100 years. The maximum acceleration response spectrum maintained for Ben Ezra Synagogue for the fundamental resonance frequency of the church which is 6 HZ, is about 100 cm/s2 for 5% damping oscillator. As for the other resonance peaks for the roof nearly the same spectral acceleration occur (0.1 g). This is in a good agreement with the probabilistic PGA calculated for exposure time 50 and 100 years (0.15–0.2 g) . Refraction microtremors test was applied to four tests in and around the Synagogue to detect the shear strength in terms of S-wave velocity and detect the average depth of the bedrock. The test was done using normal p-wave geophones and normal refraction equipments. The test was done using 30 records of 20, seconds each cultural noises coming from culture disturbances inside sand bags and leveled 14 Hertz p-wave geophones. Using multichannel analysis of surface waves (MASW) using Refraction Microtremors technique described by Louie . The excluded models for S-wave velocity with depth for ReMi profiles ReMi-1 to Remi-3 are shown in Figs. 9, 10, 11. It is noticed that outside Ben Ezra Synagogue, the S-wave velocity detected is about 900 m/s for average depth of about 6.5 m, and reach to 1600 m/s from 15 to 28 m depth. The bedrock velocity is thus 4–6 m at Synagogue site (USGS, 1980 take S-wave velocity of > 765 m/s to be the velocity of the bedrock). For Assessments of seismic hazards, a seismic source regionalization methodology was utilized assuming that in the future the location of major seismic activity will be limited to the boundary and intraplate tectonics of the micro-plates as it has been over the course of the recorded history, regardless of the times at which these boundaries was locked for considerable periods . The peak ground acceleration attenuation relationships used in this study is the mean maximum horizontal accelerations over the bedrock. With soil deposits of soft-and medium-stiff sands and clays of appreciable depth the ground accelerations will be considerably modified and should be taken into consideration. The maximum magnitudes assigned to each seismic source zone have been based only on the historical recordings within each source zone. It should be noted that higher maximum magnitudes can affect the iso-acceleration contours of these maps [41, 42, 43, 44]. The recurrence of earthquakes is very important for determining the future plans for sensitive structures like the archeological sites. We have calculated the return period for Magnitudes M ≥ 5, M ≥ 6 and M ≥ 7 for most affecting zones at Ben Ezra Synagogue, as referred in Table 3. This study, suggest moderate level of earthquake activity at Ben Ezra Synagogue and this is in a good agreement with the fact that “Egypt is a part of the stable African Shield”, but the existence of old structure such as the Ben Ezra Synagogue may reduce the ability to resist any earthquake shaking. Although it was difficult to get and gather the kind of data needed to construct hazard maps in Egypt because of lack of data and no cooperation exist between agencies, we succeed to generate two important kinds of maps and these are the “Maximum Intensity Zonation Maps for Ben Ezra Synagogue” and the “Iso-Acceleration Contour Maps for Ben Ezra Synagogue”. To great extent these maps succeed in forming a general picture for the amount of hazard that Ben Ezra Synagogue is subjected to . Among the important points that are worth mentioning is that most archeological sites such as Ben Ezra Synagogue is not seismically assessed in Egypt, no seismic hazard assessment studies were applied for these important archeological sites nor any reinforcements. The hazard maps in Ben Ezra Synagogue based on PGA in Gals (cm/s2) and 10% Probability of Exceedance over 50 and 100 years, shows relatively moderate rate of hazards 0.15 g and 0.2 g respectively. This PGA level (PGA > 10% g) is of significance to engineers, as it is the common threshold for taking seismic safety measures for normal structures and should be taken into consideration. Also the hazard map in Ben Ezra Synagogue based on Maximum Intensity value affected the area collected from instrumental and historical seismicity, shows maximum intensity VII. The hazard map represented in this study constitute a rational attempt to estimate the probabilistic PGA hazard in Egypt and are intended to serve as a reference for more elaborated studies; it is, therefore, open for suggestions regenerated based on different data bases, assumptions and the inputs in order to evaluate seismic risk which aid in defining true seismic zoning or seismic building code for Egypt. Natural frequency of vibration for the basement floor is determined using the stations. The natural frequency of vibration for basement floor for Ben Ezra Synagogue. It can be seen that there is no or little resonance peaks and little or no amplification exist for the basement floor. 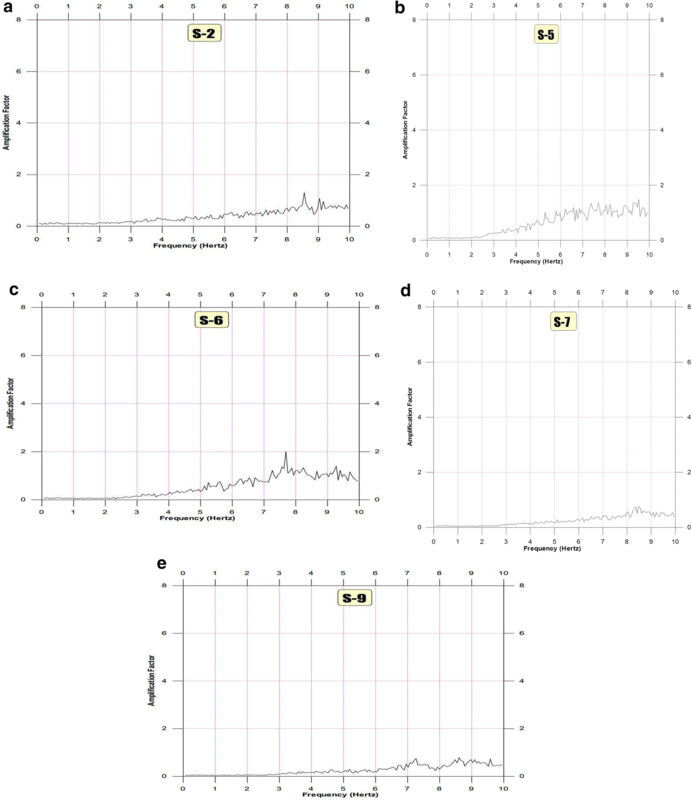 The roof stations and its resonance curves are found in Fig. 4. The fundamental natural frequency of vibration is 5.5 Hz while the second and third peaks are found at 7.7 and 9.3 Hz. The amplification factor determined from this method for the roof is between 3 and 10. Among the important points that are worth mentioning is that most archeological sites including Ben Ezra Synagogue are not seismically assessed in Egypt, no seismic hazard assessment studies were applied for these important archeological sites nor any reinforcements. Adding the main deficiencies of the vertical and horizontal components of the structural system, the Ben Ezra Synagogue could be classified in the first seismic risk class “Rsl” according to the Egyptian technical legislation (building with a high level risk of collapse in case of occurrence of an earthquake corresponding to the code of seismic intensity to Cairo city (a = 0.16 g). 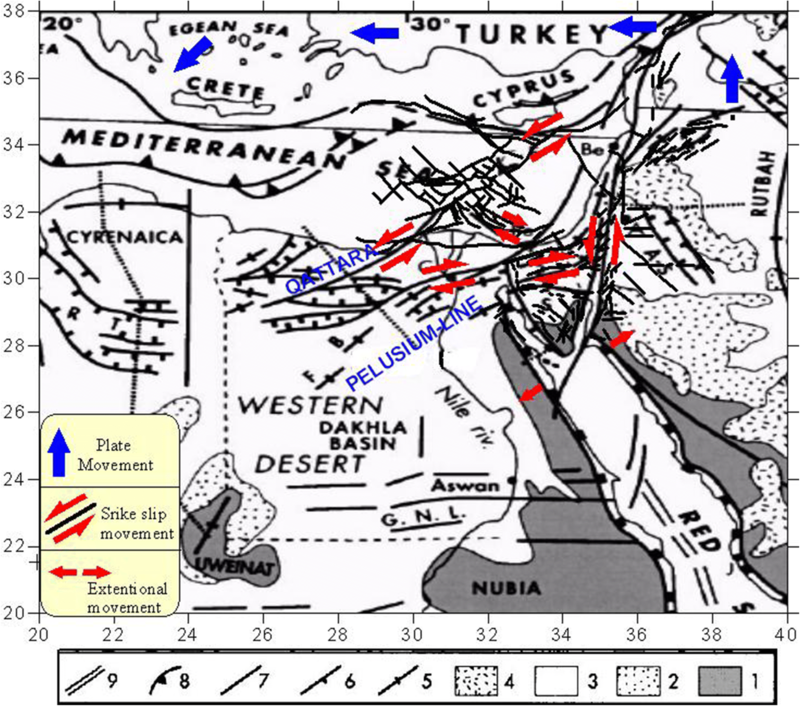 Finally, the tectonics and, therefore, the seismotectonics of Ben Ezzra synagogue are the result of the effects and interactions of the afore-mentioned tectonic regimes of the Eastern Mediterranean, the Red Sea and the intraplate areas of special nature. The strengthening of an old monumental unreinforced masonry building are domains where decisions are taken based on risk analysis, in order to reach a compromise between the historical value, the cost of investigations, and the cost of interventions. It was found out that the Ben Ezra Synagogue has the tendency of localizing damage at the first floor and roof levels, with the development of a “soft and weak levels” effect (situation which corresponds to a possible general progressive collapse. Present, the strengthening solution is required, and the works for retrofitting and modernization of the Synagogue is required, as the owner will allocate the necessary funds.